Let us know what you think about these features and if they're improving any of your workflows. Chantal and the rest of the Evernote for Windows Team! Context specific views: Choose to save a view for a specific Notebook, Saved Search or Tag from the navigation context menu by selecting “Save View” or choosing the option from the Note list view drop down. Settings that are stored are view type (Snippet, Card, List, Thumbnail), sorting order, and columns and column order if you use List View. Google Drive integration: Instead of pasting links to files, Drive content added to Evernote will now include thumbnail previews and a rich viewing experience. You can also search Drive from Evernote and any changes to files in Drive will sync automatically with your notes. There’s even a handy icon in the Evernote toolbar to jump right into your Drive. Many sync conflict issues: we’ve made several fixes so that you should see fewer note conflicts and more automatic merging of content when editing notes across devices. If you can save a view to a saved search, does that mean that view settings are now a part of the search language (ideal, as they could then be used with ENScript), or at least recognized in the search box? There's certainly been a fair amount of call for saving views in notebooks, so Bravo! 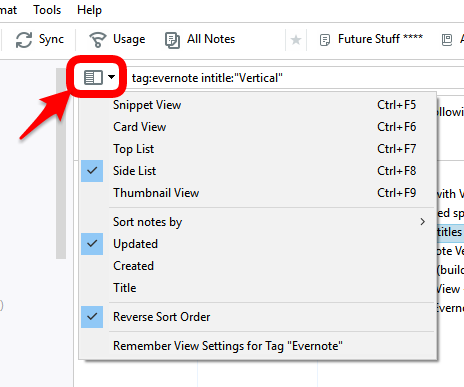 ; I'm not convinced about associating a view with a tag, but I've been wrong about Evernote features before. For all the guys out there at Evernote, Cheers!!! Being a software engineer myself in the past, i know how painful it is at times, and at times even stressful at work. Here is my small note of appreciation. Fully and totally appreciate the efforts that are going into bringing new features that immensely add value to the product. You guys are just not building a product that makes money to someone. You guys are addng so much value to our lives. If someone out there at Evernote is spending long hours, and is by any chance taking a break and coming to India, please do drop in my humble home. All Evernote employees are welcome home at any time. It would be my pleasure and honour to host you guys, to the best possible of my meagre resources. Please note that saved view attributes include notes sorting order and other view specific properties, like Thumbnail View zoom factor and List View column set and order. Here's an example: I have a tag named Pictures and when I select it, the view automatically switches to Thumbnail View sorted by Created Date. Notes with tag Pictures are found in many different notebooks (Travel, Family, etc), and I want them to be displayed nicely every time i'm viewing them without manually switching to optimal view from my default Snippet View sorted by Updated Date. Thank you, Sugeeth, really appreciated! We cannot change search grammar on one client. Evernote search grammar is supposed to be the same on all Evernote clients. To Implement Remember View feature we simply associate view descriptor with a left panel item (notebook, tag or saved search). This view descriptor is activated when the item associated with it gets selected. Being able to save a view to a saved search is a killer feature. Nice work! Thank you! Hold Ctrl key, right-click on the note and chose "Copy Note Link"
Go back to the note that contains the web URL I want to change. Right-click on the link and select "Edit" from the pop-up menu. Press Ctrl-V in order to overwrite URL displayed in the address box with the previously copied note link. However, instead of note link title being the title of the corresponding note, it is a note link address. Yes, I understand. But darn, anyways. And I live on in hope. Thanks for your replies here. The feature as it is is a good one, and will be well received, I'm thinking. In Evernote 6.3.1, when I click on tag in the shortcut (left pannel) the selection go to the original tag in TAG section, my tree is very complex and much long so I lose the focus on shortcut section and this is annoying. Is this a wanted behavior? is it possible have a option to disable it? The former key combination does not work - it used to be Ctrl + Shift + F5. After doing some extensive hunting, I found it. For the users stuck in the same pickle, here is the solution. The installation also changed the column sequence and narrowed the size to a uniform width for all columns in the Note List panel. I have not seen previous installations make so many changes to my default settings. "View Settings" = Great! Great! Great! Now my notebook for the next big thriller gets the view "list, title, alphabetcal" - and the draft notebook for the new flyer "thumbnails, last edited". Great support for daily routine! Thank you! Uncheck "Scroll left panel item into view when item is selected" under Navigation in options. Thanks very much. probably the update change it or something like that. Is there any way to backup/transfer "saved" views by copying a settings file? Not at this point. What's the use case? have not seen previous installations make so many changes to my default settings. Yeah, Context Specific View feature affected all the view settings for each type of note list view. They are now stored in the database instead of registry, and the format is very different. Well as I see this as a feature with great potential, so it would be nice to change the views on only one computer, and then just apply those changes to my other machines. Syncing the settings would of course be even better, for me at least. Another thing would be to prevent that a future update/reinstall would remove all the created views. It would be unfortunate if you have spent a decent amount of time to perfect a lot of views over time, and then one day have to do it all over again. Like @jbenson2 my default view was changed from Side List to Snippet and the columns in list view were re-arranged, hopefully not the intent. I created a Thumbnail view for receipts, many columns and the right size note window for viewing receipts, Very nice. I created a custom view for my Late task search (added remindertime and sorted by it). Very nice. When I went back to All Notes the view was the Late task view I had just remembered. Not so nice. I deleted the remindertime column and the view for All Notes seemed to persist from that point when I switched between other notebooks and searches that had not been remembered. So fixable, but not sure it is the process you want to have. It would seem to me that whatever the user has set as a view when they do the update would become the default (view, columns, sizing, sort, etc.) Plus, there does not seem to be an option to remember the All Notes view, nor set a default view that I could find. Good stuff in any case. Thanks for the goodies! Just so you know, it's been there for a while now, maybe starting with 6.0? Glad I installed on my backup laptop. But really, not that big a deal end of the day. Yay! Looking forward to being able to save sort order for specific folders. Installed today but I don't see the handy icon. It's on note Editing Toolbar between "Attach file" and "Record Audio" icons. 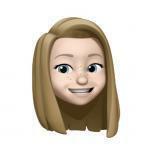 When I saw what the new feature was to be tested, I was excited- I've been wishing for this for a long time! I've been looking for a way to have some notebooks sort by reverse date, some alphabetically, etc. How does it work? When I go in and change the sort order on a notebook, it still changes it for all my notebooks. I *assumed* that one could use this to save a sort order, etc. for one notebook and it would only change that one notebook...? 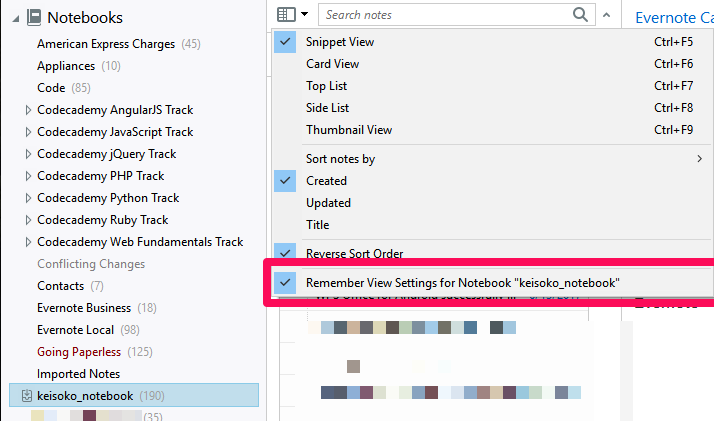 When you are done setting your views in the specific notebook, you need to select "Remember View Setting for Notebook <notebook name>" from the drop-down menu of the box next to the search box. Thank you for the assistance on the location of the Google Drive icon. So I created a new note (containing only the letters qqq) and clicked on the icon. Then it prompted me to sign on to Google Drive and agree to share stuff between Evernote and Google. Then my 2nd Factor number request via my phone. What happened next totally baffled me. Instead of seeing JUST my documents in Google Drive, I got a page with hundreds and hundreds of thumbnail photos from other people. Vacation photos, flower photos, museum photos, people I've never seen photos. As I scroll down the screen, I occasionally see some of my documents. Does anyone have an idea what is going on? Kudos for adding screenshots to what's new. Much appreciated it. 1.) Thanks again, but the feature does not narrow my selection to "My Drive" (which contains my Google Drive files). I don't want to see other people's documents. I only want to see mine. If I can see all these people's information, I wonder how secure my information is. 2.) 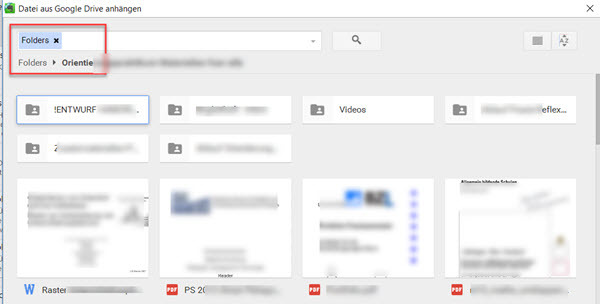 How did you do a screen capture of the Google Drive pop-up? My Evernote can capture websites, but will not screen capture the Google Drive pop-up screen. I think I have a work-around solution. In order to only see just my information in Evernote's link to Google Drive, I have to add the search term "owner:me" to the search window. I don't want to see other people's documents. I only want to see mine. 2.) How do you do a screen capture of the Google Drive pop-up? My Evernote can capture websites, but will not screen capture the Google Drive pop-up screen. I captured google drive box screenshot by utilizing Alt-PrtScn since I have 4 monitors connected to my computer. Then I used New -> Clipboard option in Skitch to paste the image into Skitch and do necessary editing. After I am done editing, I save it as the image to my hard drive and then added here. The link to Google Drive docs is very welcome, it works and places an icon for the link but the title of the drive doc is missing, instead it says "Title not available" as per the attached image which gets confusing if you have links to several documents. Just love the remember view settings option, brilliant. Must be a serious security breach bug on Google's part. I don't see how Evernote could somehow do something "wrong" to let you get access to other peoples Google accounts. That was my thinking yesterday. After doing some more research, I believe the other people's photos and documents I see are publicly shared. At least I HOPE that is the case. Maybe Evernote will comment on this. The icon supplied in Evernote defaults to everyone. I have to add a search term (owner:me) to limit the documents to mine only. If I add a negative (-owner:me) then I see everyone else's documents. Google Drive defaults to My Drive - I only see my documents. You need to authorize Evernote to access your Google Drive files. You can do that by clicking the Connect link, entering your Google credentials, and clicking Allow. Until you do that, the Evernote client can't display any metadata associated with the file as it doesn't have access to it. when I click on google drive icon, one window appears and close 1 second after. how do we set the link Evernote Drive ? Not specifically related to this beta, I'm guessing this has been there a while. I use less than 10 notebooks and just asked myself why have Recent Notebooks showing, makes not sense when the list is so short in the first place. So I went to options and changed Max number of recent notebooks to 0. To my chagrin, All Notebooks is no longer an option in the notebook drop down in the search explanation. With the changes to search in 6.0 this doesn't make sense to me anyway. Easy enough to fix by setting recent notebooks to 1, but still seems to me for search to work "right", All Notebooks should be an option in that drop down, when you opt to refresh search as you click all notes in the toolbar, as I do. It is authorised, there is no problem accessing my google drive files and linking them to Evernote, I do it on the web version and android, it's just the windows version that shows this error. OK, I see. If you do authorize on Windows (even though it's redundant), does it start to work? It could be that we're not picking up that the auth occurred on a different device, we'll look into that. Are there any error messages in the log (Help > Activity Log) when you do this? I recommend Evernote create a How-To Guide and video for the new Google Drive icon feature. I know that...what I'm saying is... when I change the sort order for a specific note, with this new feature I would expect it to change just that note. What it *is* doing (for me anyway) is still changing *all* the "unremembered" notes to that selected sort order (other than any other notebooks that I have remembered settings for). This would seem to suggest that I need to go into *every* notebook and remember a sort order, which I know isn't right...right? You have to set "Remember View Setting for Notebook <notebook name>" first, then change the special settings as you want them. Otherwise, you change for all views first and have to change back. EN team...this is a BIG deal...THANK YOU! Installed and fine, so far. Today I generated my first note with a Google Docs file. It links, it displays in the pertinent notebook, fine, so far. However, since then the desktop client hangs if it is to show the all notes list. My observation is that this appeared first time after generating the new Google docs note. The client works fine in any notebook other than the all notes/all notebooks view. finally i succeed for google drive. need to go in evernote web and click on drive small icon, then google is asking permission. After on desktop it is working fine. For a "specific note"? Did you mean "notebook"? You cannot change sort order for a note. The View Settings menu (I don't know whether that's the actual name) is the starting point: it's off the button with a dropdown to the left of the "Search notes" textbox that appears above your note list. You can now associate a View Setting (note list style+sort setting) with any named collection of notes: a notebook, tag or a saved search: select the notebook, tag or saved search, get things arranged as you like, and check the "Remember View Settings for ..." checkbox at the bottom of the view menu (if it isn't already). If that checkbox is checked, then that's the View Setting that's currently in force. If you later make changes while that View Setting is in force, it changes the settings for that collection. There's a default View Setting that's used when a specific (notebook, tag, or saved search) view setting is not in force. (the "Remember View Setting for..." checkbox is not checked. That includes the "All Notebooks" context. If you do an arbitrary search (using tags, literal text, date/time, stack, etc. ), you should see "Remember View Settings for the Current Search" in the View Settings menu; check that, you'll you'll be prompted to save the search (and the View Settings will pertain to that Saved Search). Don't check it, and you're just modifying the default settings. Note that you cannot save a View Setting for a stack, unless it's used in a Saved Search. Also, you cannot save a View Setting for a tag that's shared with you, unless it's part of a Saved Search. Curiously, you can save a View Setting for a notebook that's shared to you; I haven't tested this yet, but I suspect that that View Setting for that is local to the account that it's created in, and not for the original account, but that's just supposition. As far as I can tell, Reminder settings, including sorting, is not included in View Settings. You don't need to set specific a View Setting on every notebook, tag or saved search; if you choose one of these, it will just use the default. It's probably a good idea to set your default to the View Setting that you would use most frequently (I almost always use Snippet/Updated/Reversed, so that's my default), and then set specific View Settings on contexts where you require something specific. Notes may be a part of multiple named collections (all notes are in some notebook; but they can also be a part of a tag filter or a saved search filter) they are sorted by the current note collection's View Setting if any, or the default otherwise. So I used the Google Drive icon for the first time today. The Evernote window which I get to view files on the drive with seems to list every file in every folder on my drive - which is a problem because my photos automatically go to Google Photos and there are a 1000 or so picture files in there. The only way to find one from Evernote is to search. Shame I bothered setting up a separate folder within Drive for 'Evernote Attachments'. The window also takes forever to populate with that many files. The file I wanted to attach was somewhere amid the pictures. I tried the process again with a random file just to check the name would be shown immediately, then wanted to delete the second icon I had created. The 'more' menu shows me "open" or "copy link" but no 'delete'. I managed to open the file a couple of times by clicking on it while trying to select it for deletion. So far this is a good idea, but a little clunky in execution. If you already have a lot of files in Google Drive (and/ or Docs) it's very clunky. Nice job so far, but keep polishing guys, keep polishing! in the Beta is it possible to change background note color or table cell background ? No. Usual rules apply. Set up your table in Word (or something similar) including colors and layout. Copy and paste to Evernote. Select a tag shortcut in the shortcuts bar and set the view, side list - sorted by title. When I go back to All Notes the sort is by title, not what I expected since it is not the tag shortcut view. Change the All Notes view back to created date sort. Go back to the tag shortcut view and it is still sorted by title. Good. Go back to all notes view and it is still sorted by created. Good, but why did I have to do it. And the sort indicator caret in created is missing (???). 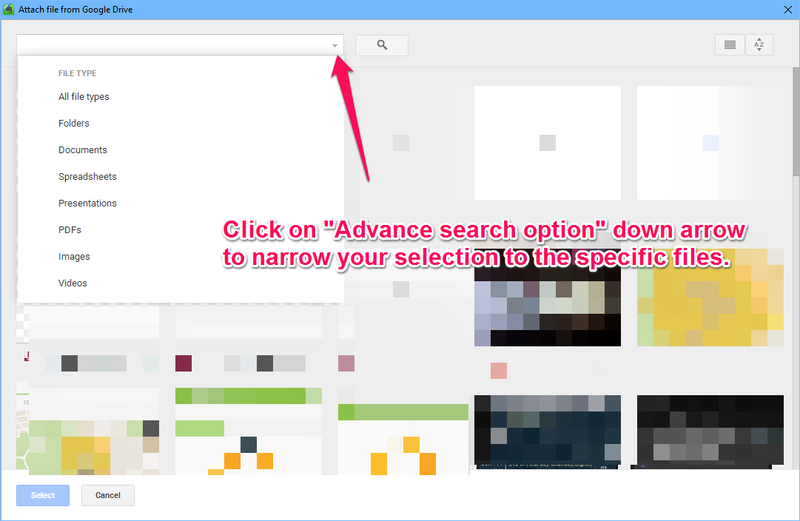 Execute a saved search, adjust view to thumbnail and remember view settings. Go back to all notes and the view is now thumbnail. Change all notes back to created sort and all is well again. Maybe it's a feature, but I don't think remembering the view in a saved search or other specific notebook should change all notes or the default view (however that is determined). Which is what I think happened in the above. Also, far as I can tell if you remember a veiw and then change it, you have to toggle the remember setting off and on. You might be right about this -- there's something a little weird going on that I don't understand (but thought that I did, story of my life). Thought that I tested these scenarios, too. Oh well, maybe that's why I'm a developer and not a QA person. But yes, I think that changing the View Settings when you have one that's active should just change those View Setting, without you needing to do anything else, and should not affect the default. Needing to toggle the "Remember..." setting on/off to save is pretty much non user friendly and not very discoverable. Could just be a beta thingy, too. It'd be nice to hear what the expected behavior and rationale is. Maybe an explicit "Remember View Settings as Default" should be a menu item, in addition to the "Remember View Settings for Notebook/Tag/Saved Search". Yeah, great feature for sure, glad to have it, using it already. Hopefully it is a beta thing. To me user default settings are kind of like a baby's view of the world, if I can't see them then they must not exist. So far so good! Once I learned the trick to the note sort order locking, everything is working great! I feel kinda like the opposite: default settings as what I want to use most often, and only switch from them whenever necessary; I just don't change the View Settings that often. The new View Settings really make it easier for me in that case, as I can set up the few instances of views where I want to differ from the default, and switch to them easily.. Agreed, i use defaults the same way, My point was more an attempt at humor relative to the existence of defaults for view settings. Can't find them so they must not exist. I think what they have is fine without additional menu options but they do need to fix the issue with all notes settings changing when one of the specific views is changed. The toggle thing is definitely not user friendly. As already said, hopefully just a beta issue. I don't see the issue you are talking about. Like mentioned earlier you have to check "Remember View" before you customize a specific view. If you change the view first, you change the default view like you always have. Evernote has no way of knowing that you don't want to alter the default view if you first alter and then later check "Remember View". I bit more intuitive text (but more clumsy) would be "Save all subsequent changes to view settings for <notebook/tag/saved search>"
Thanks, how you discussed default view - the default view changes by any changes to a view not set as remember - helped. But if that's the baseline, reasonably good chance some folks will "hose" their default view without knowing it <sheepishly raises his hand> (save before you start is a bit counter-intuitive). Relative to EN knowing what you are up to, imagine if you looked at this from the other end and any changes to a view were remembered without the user having to take action. That's what occurs after you have set a view as remembered. IAC, one issue for EN, if you want the All Notes view not to be the default view, not sure how you can accomplish that. Bug. This just started, When I do any tag search the beta crashes on both my prime and backup laptops. Going back. EDIT: Back on 6.2 and all seems to be well. If no one else has the issue perhaps just an anomaly for me I suppose. I'll give it a rest and try the backup laptop in a few days. Like mentioned earlier you have to check "Remember View" before you customize a specific view. Sorry, but that is so backwards, if it's intentional. Common UI practice is to allow user to make changes, then Save (or "Remember"). It's pretty much guaranteed to cause user confusion. And the requirement to toggle off, then on again is absurd. I doubt that that will last. If you change the view first, you change the default view like you always have. Evernote has no way of knowing that you don't want to alter the default view if you first alter and then later check "Remember View". Hence my opinion that it would be much clearer to have two menu items, one for default (which is just really just the most recent non-context bound setting), and one for the current context (Notebook, Tag, Saved Search), pretty much as it appears now. I think that they can, and will, make this easier and clearer to use. This is beta, after all. 1. system hangs on thumbnail view ONLY when reminders are opened ( i have a ton dated and non dated ) When I switch back to snippet view and open the reminders no problem, but if i go to thumbnail view I have to close the reminders list or it hangs. I have to basically force close the application. and relaunch. Well this scenario is a bit different that usual UI design, since the thing you want to save should at the same time not overwrite earlier information (default view). It's similar to wanting to do changes to a word document but still keep the original version - you start by saving a copy and then make the changes. Maybe a better description would be "Only alter view settings for <notebook/tag/saved search>", as you get a check mark when clicking in the menu. The "bonus" is then that they will also stay that way. OK, a new feature request about search triggered this: the notion of saved View Settings. Sometimes we've done an ad hoc search, and we just want to change the view settings to something more apropos. The suggestion was about the ability to make it easier to switch between their favorite two view settings by changing the view menu. So Instead, now that we have persistable view settings that we can attach to various contexts, wouldn't it be a nice addition to have named view settings that you can apply any time you need them? This build broke the Evernote Outlook plugin for me. Every time I click within Outlook to create a new Evernote note, Outlook simply freezes and won't unfreeze. It was working fine on the previous build. We're still figuring out the specific defaults to use for this view, but you can narrow your search to documents only via the dropdown in that dialog. You can click the "Connect" link to authenticate directly from the link, but it sounds like you got where you needed to be in the end. 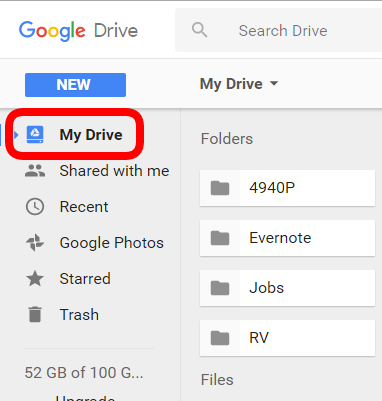 As I mentioned previously, I would like to see some way to only access Google Drive's My Drive (only see my documents and my photos). Adding the search term owner:me helps, but I don't think the Evernote default should be so wide open to include other peoples' content. I brought your feedback up with product management yesterday and they're exploring options to make this configurable. Not sure what the timeline is, but they're working on improving the experience. Is this happening with the tag picker? We're working on resolving a race condition there. If you check the "Close Tag Picker when selection is made" option, it will temporarily avoid this problem until we have a fix in place. Okay. The beta worked for a while before it broke (or I just didn't do any tag searches as I tested the remember view process). I took both machines back to the existing public. I will update my backup and report back. Thanks. EDIT: After reinstalling 6.3 on backup laptop. Changing the option made no difference, EN still crashes, once even prior to tag selection. A few other anecdotal observations. When 6.3 came up it was in Side List view (my "default" view), as opposed to Snippet the first time it was installed. It appeared the views I had remembered were still in place after cycling back to 6.2 and returning. I adjusted the default view. One and two make sense I suppose because I did not do a DB rebuild. It is in Snippet view with no notes showing, "No matching notes found". Not my default view. Then select All Notes and All Notes appear in Snippet view, again not the default. All Notes was Side List view prior to the crash. Click on any other notebook/tag/search and the view changes correctly to default or one I remembered. Return to All Notes and it is now back to Side List view. The crash reports were emailed to you guys. Any other suggestions let me know. OK, sorry to hear that. Thanks for the crash reports, we'll continue to investigate. Thanks for the report. What version (year) of outlook are you using? We have not got any other reports for this same issue, so additional to the Outlook version info + Windows version info, can you please also provide us with the Outlook Clipper logs so we can investigate the matter? or via "Logs" button in Clipper (Evernote Outlook Clipper plugin) options. Yes it does start to work for that instance but the next time I add a drive file I have to go through the same process to re-authorise. Hi there, my Evernote just updated itself from Evernote Touch to Evernote for Windows. I primarily use a touch screen and the new app isn't as enjoyable or easy for me on my touch screen. I also really enjoyed the sleek, stripped down, clean design of Evernote Touch. Will a Touch-oriented version be coming back, or is there any way to change the Evernote for Windows display to look/feel like Evernote Touch? Thanks, I am on Outlook 2016 64-bit on Windows 10 64-bit. My workstation is very powerful, with plenty of RAM and CPU, so I'm sure that system resources are not the issue. Edit: just realized there is some sensitive info in the logs, I will send them separately. It appears that every time I want to add a google drive document to a note I am having to re-authorise Evernote to access my Google Account. This is only happening on my windows version, the web and android versions are OK. I installed this beta around a week ago, and it was working seamlessly until today morning, when i guess Windows update got installed. Since then, this has become totally unusable. Primarily, the most impacted, is when i click the mouse, the response time is so laggy. It takes 10 to 15 seconds to respond. For instance, when i scroll down the note in the center bar, and i click on a note, it takes 10 to 16 seconds to display the clicked note on the right tool bar. I am going back to the Windows Public Release to see if i can replicate this problem, but i am almost certain that it has a conflict with some windows update, since upto today morning, it was running perfectly fine. I also checked the Task Manager to see if there is any memory over load of a single app. I find nothing of that kind. Both CPU and Ram usage are very much under control. Other apps are running smoothly. It is some Windows 10 Update conflict Vs Evernote Beta issue. I'm heading towards unusable too - the good bit: double spaces in the Outlook email clipper have disappeared. The bad bit - my regular syncs are set to every 30 minutes, and in the normal way of things I don't get up to much between syncs. I do have a big database - 15.8GB with 20 notebooks and 22K notes (mostly in the default notebook). However my last sync lasted close to an hour. I'd added one note - a copy email total 60KB - and while memory and CPU usage were normal, disk usage hit 100% and stayed there. It didn't stop me using the system, but everything was. very. slow. When the sync ended there was no sign that things went wrong - no exclamation point and Ctrl+Sync found no entries - but the Activity icon shows two sync conflicts in copy Gmail notes. I'll fix those and retry. Any suggestions from the professional seats? You can also use the Win+PrtScn Evernote global shortcut. It will allow you to screenshot the pop-up window. It will then by default save to EN and open as a Skitch document, or you can do the "Hold CTRL for clipboard" option stuff. I just save to EN and then drag-plop here. The default behavior of EN is to change all views when changing the view you're in, so it makes sense that you have to choose to make this instance unique before doing the changes. I just think it needs to be documented, because while it fits in with EN's history and behavior, it doesn't fit in with general app behavior and it can be confusing. I am having struggles with app speed in image-focused searches. For example, I have a GIF tag (no judging) and usually I can click it and scroll through my notes like a boss, finding that perfect gif that just nails the mood. Now, no matter the view, the images either lag terribly or load as simply static images. So much so that I went to copy the link to a gif and accidentally clicked Clear instead of Copy. And since Ctrl+Z doesn't undo those types of actions... well, there goes my link. Sigh. @jbenson2 & @gustavgi, I just came across your posts and am not sure if you have found out the answers to your question(s) above. I am using Evernote for Mac and I have had the Drive integration for some time now. It is similar to what you are using in the sense that you can view other people's content on Drive. However, I soon found out that all those files were in the 'Shared with me' section of my Drive account. Maybe it is the same case with you. I am not sure if it is a security breach of any kind. @ChiragC - thanks for your comments. I have decided to avoid using the Evernote / Google Drive connection. Seems too dicey at this time. Here is a comment from emerick (Evernote employee) who said: "I brought your feedback up with product management yesterday and they're exploring options to make this configurable. Not sure what the timeline is, but they're working on improving the experience." Went back to the previous public beta version. Running smoothly on latest Windows 10 updates. However, I get an error message, with Evernote unable to attach itself to the system tray of Windwos. This is exactly my case. I have Evernote installed on both home and office machines. So far I have more or less tuned context specific views on my home machine, and I still expect quite a lot of fine tuning ahead. As I understand, at this point manual tuning on office machine is the only (very time consuming and non-efficient) option. The possibility to copy/paste desktop app settings from one machine to another will solve the problem. Syncing the settings will be of course the best solution. The context specific views, though a relatively small change, might be THE single most helpful change evernote has made. Very nice. Being stuck with a single sort etc for every view was a blocker for smooth workflow for a long time. New and improved Beta out there now. You have to be in something other than all notes to get the option. It should look something like this.